Our goal is simple: find a way to have some fun, do some good and make people smile. 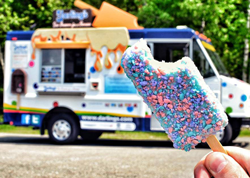 What better way than handing out free ice cream and soliciting voluntary donations for a good cause, any cause, from large organizations, to a friend or neighbor in need? 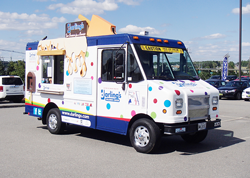 To meet this goal, we got our team together here at Darling’s and through hard work and a whole lot of creative talent, we built this ice cream truck. So here’s what you need to do: if you are raising funds for a local charity, cause, person or family in need, contact us to schedule a visit from our truck. If you need help, we’ll be there! 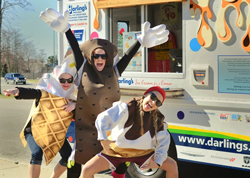 Darling’s Ice Cream for a Cause – serving ice cream to serve our community.